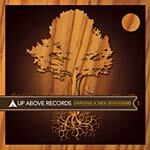 Up Above has thrown together a fresh, nicely priced compilation, culling songs from previous singles and upcoming releases. You gets cuts from Visionaries, Kev Brown, Look Daggers (2Mex & Ikey Owens), Prince Po, Supernatural and loads more! Used copy in standard jewel case. Near mint, disc and inserts. (Slight wear on the jewel itelf but no cracks.) Hold punched through the tray insert's barcode (not through the jewel case).